Objective lenses vary in the angle of light cone they can receive, their numerical apperture. The greater the NA of the objective lens, the greater the angle of the cone of light, the greater the amount of light received and the greater the resolving power of the lens. Best resolution of an image is achieved by matching the light cone angles of the 100x objective lens and the condenser lens system. Thus a condenser lens NA of 1.25 needs to be matched with an objective l00x lens with the same NA. If the objective NA is less than the condenser NA or vice versa, the higher capacity item would be of no benefit as the extra degrees in the light cone cannot be utilised by the other component. Objective lenses should have a Universal screw thread. Most objectives have DIN or RMS standard diameter screw threads that ensure that you can replace or upgrade objectives later on. Note that Nikon and Leica mounting threads are wider than RMS which limits you to their objectives. As with condenser lenses, the quality of glass objective lenses increases in proportion to the types and degree of their correction for visual aberrations. 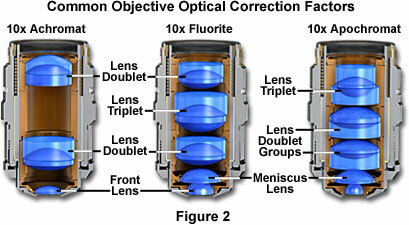 The Nikon diagram below shows the increasingly complex optics contained within 3 types of lox objective lens. The Nikon tutorial site provides much more info than the summary below as well as more wonderful diagrams of the internal parts of each type of objective lens. Make the image appear flat rather than distorted like a fish-eye lens, though the outer edges may appear slightly out of focus. Click here for reviews of currently available mi﻿croscopes with Achromatic Lenses. Plan and Achromatic Objectives tend to have similar NA capacity, maxing at 1.25 for 100x magnification. 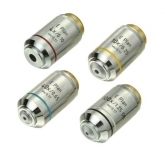 Click here for reviews of currently available microscopes with Plan Achromatic Lenses. Fluor objectives have more correction for chromatic aberration and a resulting higher NA than achromats. These Nikon Plan Fluor objectives range from $680- over $3000 for the 60x lens with the Olympus versions being similarly priced. 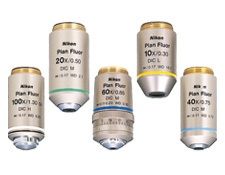 Accuscope Plan Fluor objectives range from $200 for the 10x to $1300 US for the 100 x lens. Apochromatic Objectives have even better NA (1.3) and chromatic correction. 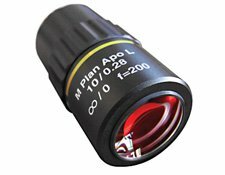 Plan Apochromat Objectives are the most corrected lenses you can buy. Cost of up to $900 second hand. A 100x lense will have a N A of 1.4. This plan Ap0chromatic Objective is over $5000 as a cleared item.